If you have any additional questions, please don't hesitate to contact me through the contact page, my social media pages or by calling me at (304) 804-HARP. I would love to answer any questions or concerns you may have and help you make your next event a memorable one for years to come! Now offering a unique wedding photography and harp music experience with Photo Harp Weddings! Click here to learn more! Weddings (ceremonies, cocktail hours, receptions), anniversaries, engagement parties, bridal shower, bachelorette parties, celebrations, conventions, corporate functions, funerals, fund raising events, church services, Christenings, festivals, grand openings, private parties, holiday parties, proms, children's birthdays, baby showers, brunches, banquets, vintage, plantation, winery, rustic and farm weddings, yoga classes, hospitals, community events, reunions, arts and crafts fairs, and many more! If your event is not listed here, please contact me! I'm sure we can make it happen. I can play anything - from classical to current popular songs, even video game theme music! I'm not limited to any specific genre. Although, interesting enough, a lot of sheet music is not written for the pedal harp. If there is not harp sheet music for the song you want, I can arrange it for the harp to ensure you have your special song for your event. Birdie, a magestic Lyon and Healy Style 23 Concert Grand Pedal Harp. More information coming soon...she's my recent addition! Beth, a magnificent Lyon and Healy Chicago Concert Series Pedal Harp. It has 47 strings, an extended soundboard, it's a little over 6 ft. tall and weighs about 80 lbs. With that said, it's pretty big...and expensive - it costs about the same as a brand new car!!! It needs a special dolly to move it around and two people to lift it up. It's heavenly sound will definitely make your event unique and sophisticated. Plus, it makes a stunning backdrop piece for your event's photographs! Trudie, an enchanting Lyon and Healy Troubadour Lever Harp. It's smaller than my concert grand pedal harp. It has 36 strings, it's about 5 and half ft. and it weighs about 40 lbs. It has a beautiful Celtic look to it that makes it unique! Frankie and Freddie, a stunning couple of Lyon and Healy Folk Lever Harps. They are smaller than my Troubadour Lever Harp. They have 34 strings, and are a little over 4 ft. tall and weigh about 30 lbs each. You can see pictures of the harps on this page. 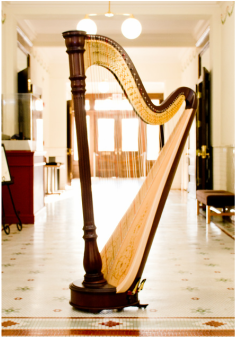 Also, you can check out my page on harps for more information about the harps I play. Great question! Price for performance can go from as little as $200 per event to $900 plus; although most average from $300 to $500. There are factors that I have to take into consideration. These include, but not limited to: type of event, type of harp, duration of performance, location, transportation, songs requests, etc. My fee for performing includes all email correspondence, telephone/video consultations as needed, time to prepare all the musical selections, organizing my music notebooks to accommodate your requests, packing and loading the harp into my vehicle, gas and traveling time, unloading at your event location, setting-up, tuning, professional performance, harp and liability insurance, and packing up again. My goal is to help you make your event a memorable one and I will do my very best to give you a reasonable price tailored to your event without breaking your wallet and work within your budget. Generally, I only require a 20% (nonrefundable) retainer to reserve the date, with the balance paid 30 days prior the event. Reserve your date as soon as possible. Dates are only reserved once the retainer is paid and contract signed. Contact me today for a free quote and initial consultation! Well, that's a silly question! My testimonials and reviews speak for themselves! They won me WeddingWire Couples' Choice Award. I'm the only harpist in Tampa Bay, St. Petersburg, and Sarasota area to win this coveted award for 2015, 2016, 2017, and 2018. Why? Aside from me giving you 110% effort and attention, you also have the option to get a full concert grand pedal harp - the real deal. Plus, you will be hiring a full time professional harpist, not someone who does this as a hobby. I work extremely hard for my events and it shows in my reviews. Because of that, I may not be the cheapest if you go price shopping (nor I'm the most expensive!). But, I assure that you will get the best, most elite and professional harp music entertainment for the value. What do you play at the wedding ceremony? I normally play about 20 to 30 minutes prior to the ceremony while guests arrive, processional, special ceremony song(s) as needed, recessional, and a 15 to 20 minutes of postlude music while guests leave. Do you do outside/outdoor weddings? Yes! Outside/Outdoor weddings (i.e. garden, farm, plantation, winery, gazebo, etc. ) are perfect for my type of harps. You can see examples throughout my website and Instagram/Pinterest accounts. What venues have you played at? Generally, no. The sound of the concert grand harp and lever harps that I play travels far and loud. But, it could be recommended depending on the venue, location, environment, and number of guests. If needed, I have a portable amplification system for my harp that could be added to the performance package at a very low price. Contact me if you have any questions! Beth - My Concert Grand Pedal Harp! Trudie - My Celtic Lever Harp! Frankie - My Folk Lever Harp! 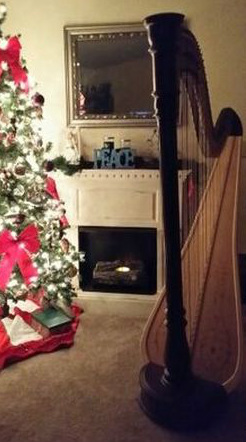 The harp is perfect for the holidays! Award winner for 5 years in a row!